Image Size: 14.25" x 18.25"
The Northrop Grumman B-2 "Spirit" is a radar evading stealth bomber with advanced technology. In its first combat test, the B-2 defeated not only Serbian Air Defense system but also the critics who had insisted it would not work as advertised. In May 1999, during the Balkan operation, the B-2 flew 30-hr. missions from Whiteman Air Force Base in Missouri to heavily defended targets in Yugoslavia and back, hitting as many as 16 targets in 16 different locations, with never being detected. The B-2s of the 509th Bomb Wing flew less than 1% of the total sorties flown by NATO aircraft in Operation Allied Force, but accounted for 11% of the bomb load dropped in the conflict. The B-2 demonstrated it can wage campaign warfare from a home base in the continental U.S. and that stealth technology works under combat conditions. This incredible aircraft, with its two-man crew of pilot and mission commander, now stands in operational readiness. 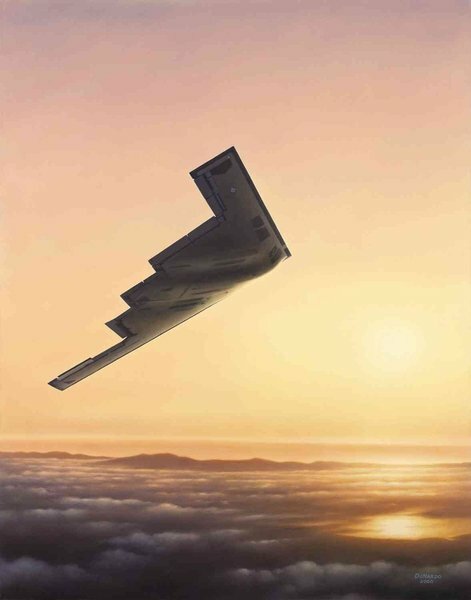 This beautiful print by Dom shows the B-2 Bomber flying home in the evening sky.